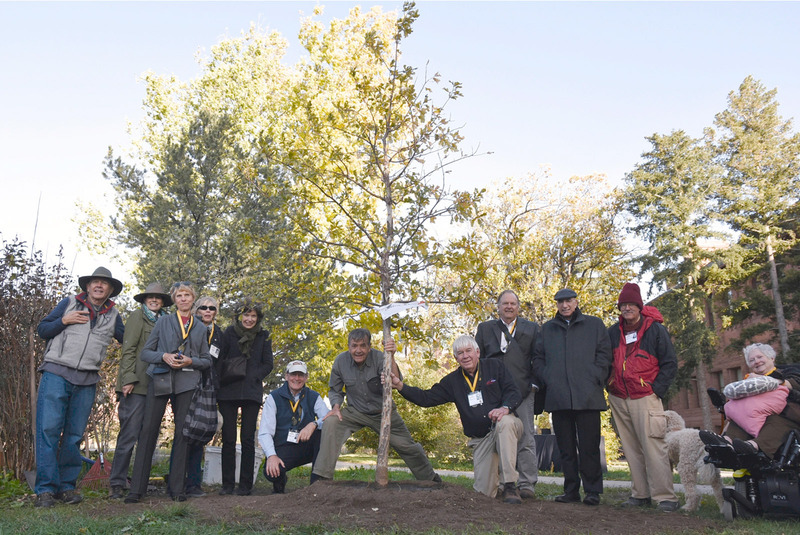 To mark their 50th reunion, members of the Class of ’67 added a swamp white oak to the Colorado College Arboretum, thus amplifying CC’s Tree Campus USA designation. Members pictured below from left to right: Rory Donaldson ’66, with wife Louisa, Jennifer Callaway, an unidentified individual, Lise Hazen, Keith Cunningham, Tom Zetterstrom, Thor Thorson, John Chalik, Gary Knight, and Loren Markley. Also at the Class of ’67 reunion, Emeritus Professor of History Bill Hochman was joined by Tom Wolf and Gary Knight at a dinner. The National Press Photographers Association recently gave its highest honor, the Joseph A. Sprague Memorial Award, to David Burnett. The award recognizes those “who advance and elevate photojournalism by their conduct, initiative, leadership, and skill, or for service or achievement beneficial to photojournalism and technological advances.” David, the subject of an April 2014 Bulletin feature, has had photos published in magazines including Life, National Geographic, and Time, and has helped mentor and inspire photographers over a 50-year career. Several of Burnett’s works will be auctioned at Homecoming to benefit his class’s scholarship fund. 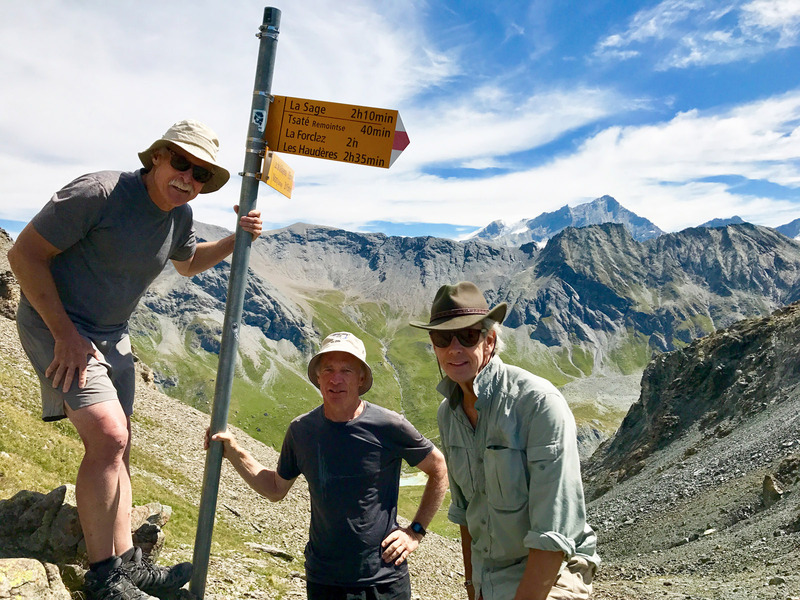 Friends Bob Kendig, Warren Dickinson, and Rob Redwine (above) hiked through the Alps from Chamonix, France, to Zermatt, Switzerland, on the Haute Route last August. 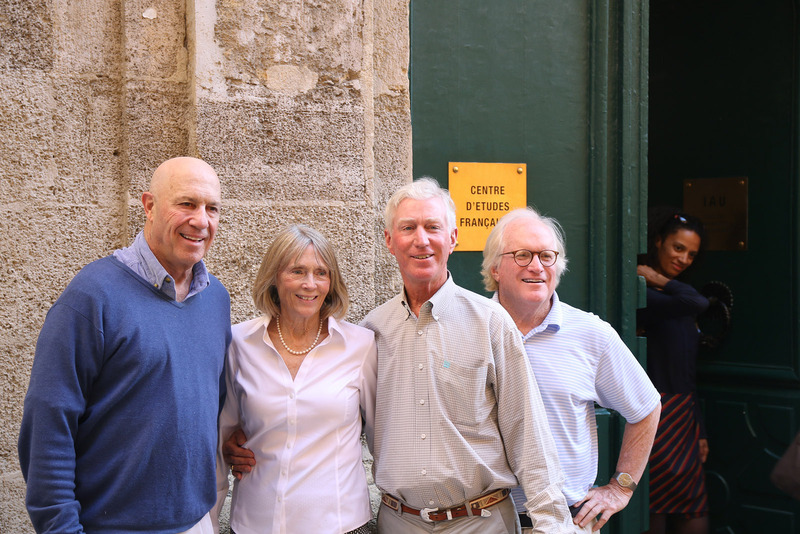 Ted Morton (above, center) has received a Lifetime Achievement Award from the Institute for American Universities in Aix-en-Provence, France, where he was a student in 1969 and 1970. (It is also where he met his wife, Bambi.) Though he officially retired from undergraduate teaching at the University of Calgary last June, Ted is still working as a senior fellow at the Calgary School of Public Policy. 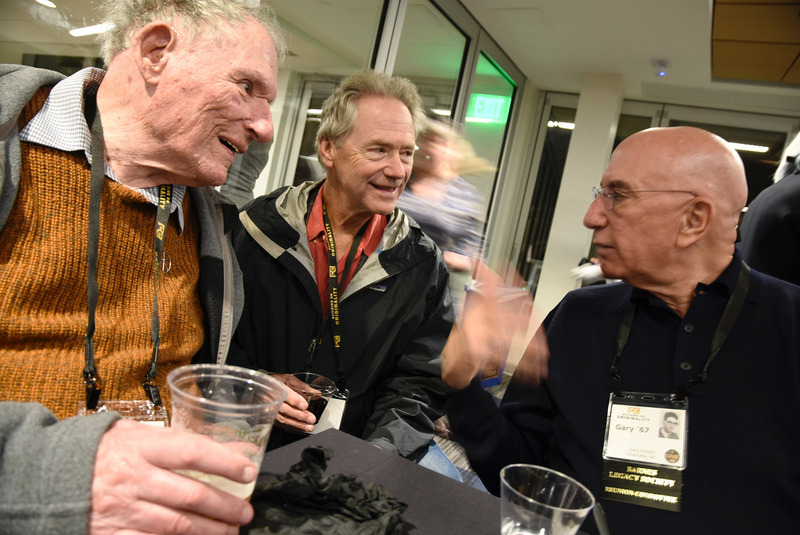 Also in attendance at Ted’s award event were Grant Williams ’72 (far left) and Rick Shrader ’69 (far right). Robert Saul has earned the Albert Nelson Marquis Lifetime Achievement Award from “Marquis Who’s Who.” Robert has spent nearly 40 years in medicine, including work in his current position as senior medical director of general pediatrics at Greenville (S.C.) Health System. He is also the author of “My Children’s Children: Raising Young Citizens in the Age of Columbine” (2013) and “All About Children” (2017). Susan K. Dutcher, a professor of genetics and the interim director of the McDonnell Genome Institute at the Washington University School of Medicine, has been selected a fellow by the American Association for the Advancement of Science. 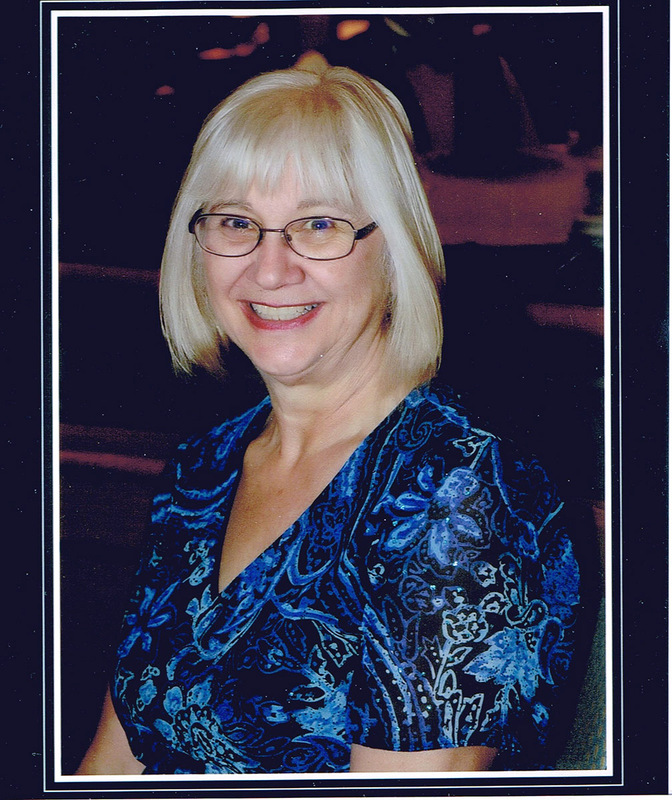 Laura Fernandez Troxel Pickering has retired after a 40-plus-year career as a K-12 and alternate high school educator in rural British Columbia, Canada. She completed postgraduate work in curriculum and instruction at the University of British Columbia in the 1990s, and an M.A. in teacher leadership and administration from Gonzaga University in 2008. Despite still spending two days a week tutoring adult ESL learners and struggling young readers, and serving on multiple boards, Laura says she would love to hear from former classmates. Craig Thompson, professor emeritus at Western Wyoming Community College, closed his lab door for the last time on Jan. 2. 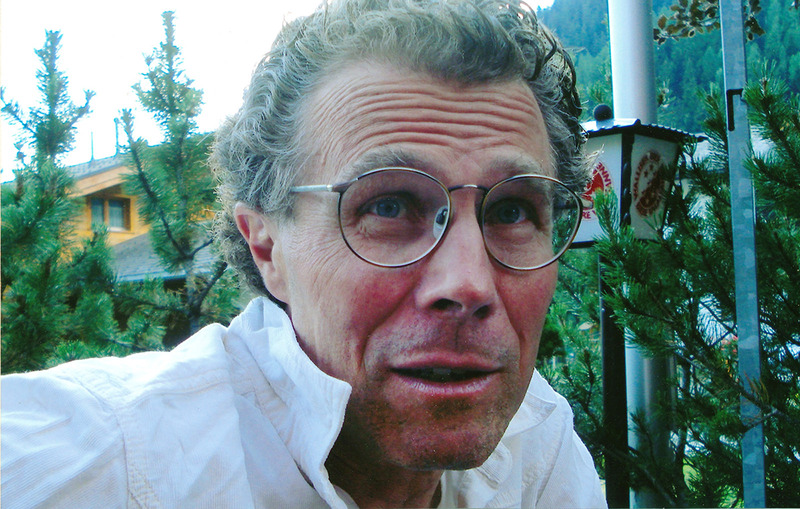 Craig was named Wyoming Professor of the Year by the Carnegie Foundation for the Advancement of Teaching in 2016 and is a past chair of the National Wildlife Federation. Inspired by studying Fountain Creek in Barry Huebert’s environmental chemistry class, he went on to be a National Science Foundation fellow in stressed stream analysis. Craig continues to do alpine-zone climate change research, but his short-term goals now include finishing “Required Reading: What Every Liberal Arts College Graduate Ought to Read” — a pamphlet given by the CC faculty to all graduates in 1975. Lili Koch Colby and Doug Sandok ’89 (below) connected last summer at the Outdoor Retailer Summer Market in Salt Lake City. 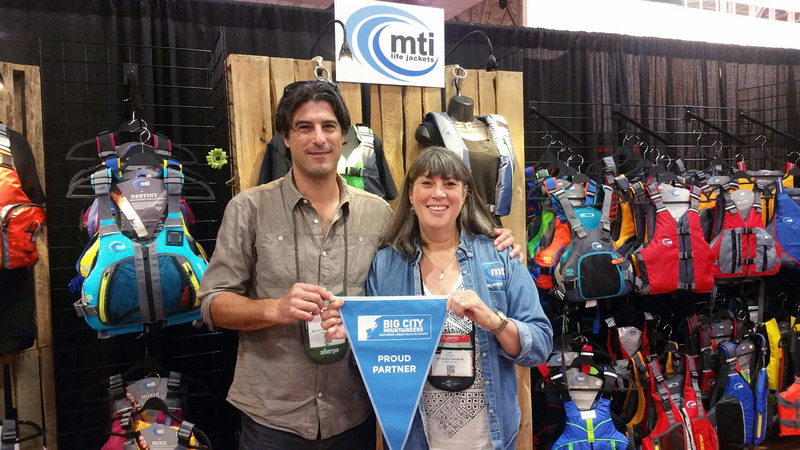 Lili is a co-owner of MTI Life Jackets, and Doug is the corporate relations director for Big City Mountaineers, a nonprofit group based in Golden that works to transform the lives of urban youth through wilderness mentoring expeditions. They agree that those four-day block breaks were key to cultivating a love of the outdoors, which ultimately led them to careers in the outdoor industry. In February, the Museum of Modern Art in New York hosted the world premiere of Amy Jenkins’ feature-length documentary, “Instructions on Parting.” The film is, in part, about Amy’s brother Craig Jenkins ’84, who passed away from a rare cancer in 2006. Many of Craig’s CC classmates supported “Instructions on Parting” in a Kickstarter fundraising campaign. For more on the film, see on-parting.com. Kevin Niswender has been named director of the Clinical Research Center at Vanderbilt University Medical Center. Kevin earned his M.D. and Ph.D. at Vanderbilt, then did his internal medicine residency and endocrinology fellowship at the University of Washington, prior to his return to Vanderbilt in 2004. His work has helped advance understanding of the neural underpinnings of obesity and metabolic syndrome. Former CC Alumni Association board member Rob Gard has been named director of PR & communications for the Greater Madison Convention & Visitors Bureau. Rob, a Wisconsin native, previously served as director of communications and marketing for CicLAvia in Los Angeles and earned “Outstanding Achievement in Publicity” honors from the Public Relations Society of America-Los Angeles. 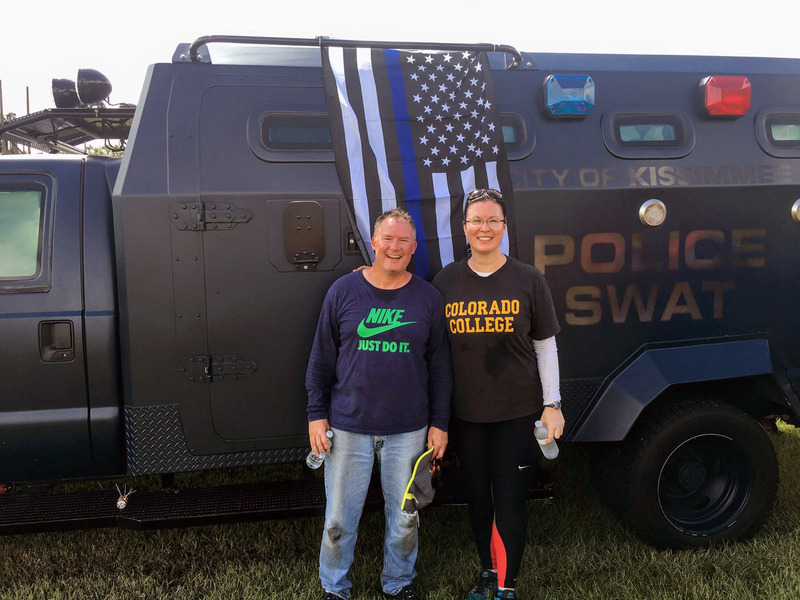 Heather O’Brien and Tim Lambert ’92 recently survived the grueling Kissimmee (Florida) Police Department S.W.A.T. Challenge (below). Heather has served as a county court judge in Kissimmee for the past seven years; Tim and his family recently relocated to the Orlando area. With the help of a Kickstarter sales campaign, Stephan Drake, founder and president of DPS Skis in Salt Lake City, Utah, and classmate Alex Adema, chief operating officer, have brought a new type of ski technology to market. The company’s polymer-based “permanent base glide treatment,” called “Phantom” and developed in tandem with a University of Utah science professor, promises to make waxing of skis and snowboards unnecessary. In November, Jacquelin Anderson Maycumber won a Republican State House seat in Washington. And in February, colleagues nominated her for the State Legislative Leaders Foundation Emerging Leader Award, a national honor. Jacquelin, her husband, and three children reside in Republic, Washington. She represents five counties: Ferry, Pend Oreille, Stevens, and parts of Okanogan and Spokane. Thatcher Glodé married Justyna Wojtach on June 24 in Winter Park, Colorado. 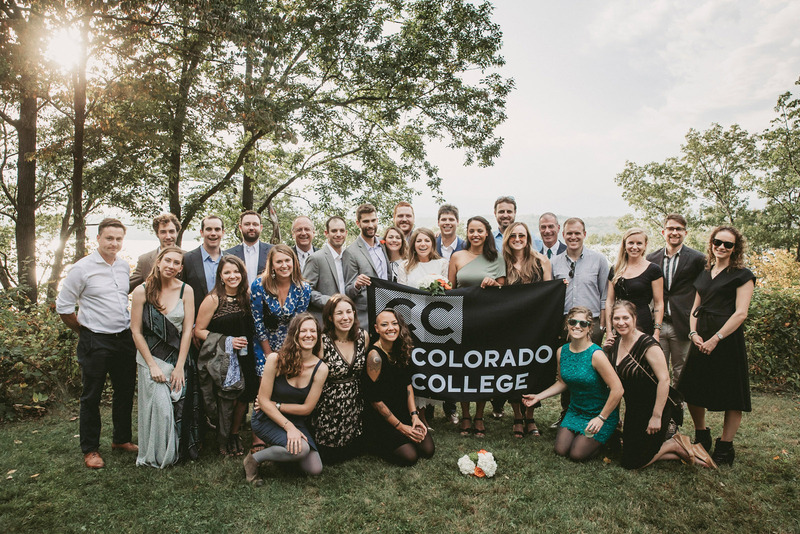 Pictured at the far left end of the accompanying photo, Thatcher was joined by CC alumni including (left to right): Chris Glodé ’98, Jammer Mattes-Ritz ’04, Chris Jain ’04, Steve Limburg ’04, Keri Sandvig ’07, Andrew Goldsworthy ’04, Brendan Schatz ’04, Louise Sanseau ’06, Brack Herfurth ’04, Paquito Lopez ’04, Willie Adams ’04, Carl Siegel ’04, Asa Firestone ’04, and Bibo Loomis ’03. After suffering a massive stroke in late 2014, Margaret “Whit” Whittum is creating a documentary film on stroke, disability, loss, resilience, and the healing power of art. A trailer and information for “The Great Now What” can be found at thegreatnowwhat.com. Jessie Pocock has been named executive director of Inside/Out Youth Services in Colorado Springs, a nonprofit that empowers, educates, and advocates for LGBTIQ youth from southern Colorado. Jessie has held various roles in the nonprofit sector, most recently as executive director of the LEAD Foundation, empowering students who struggle with learning disabilities and attention issues. In 2016, she was appointed by Governor John Hickenlooper to the Colorado Civil Rights Commission. Sarah Davidson and Spencer Hoffman were married in Germantown, New York, on Oct. 7, during a ceremony officiated by CC Professor of Political Science David Hendrickson ’75. 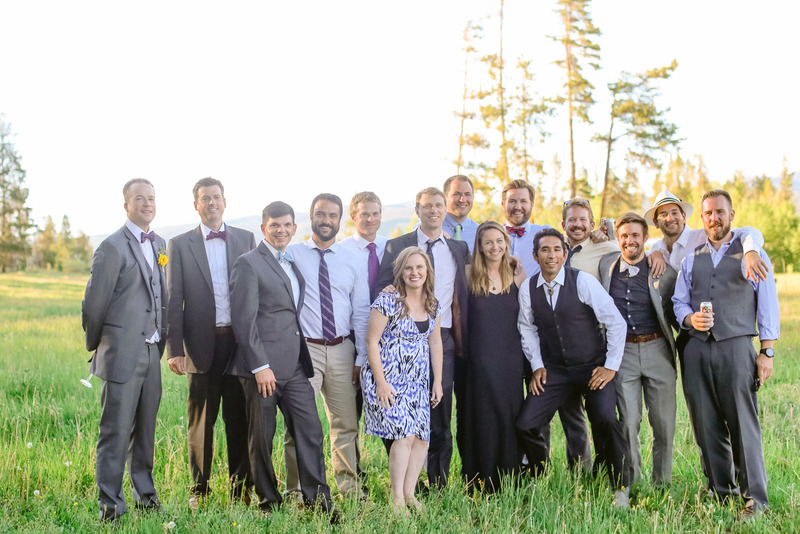 Pictured top row (left to right): Bennett White ’09, Mark Hammes ’11, John Eckelberger ’09, Steven Galinat ’09, Professor Hendrickson, Gabe Rojas, Eli King ’09, Tucker Waud ’09, Sara and Spencer, Doug Donellan, Madeline Bundy ’09, J. Matthew Davidson ’76 (father of the bride), Moss Bemis ’11, Ryan Bass ’99, Alex Archambault ’09, and Merril Stypula ’09. Second row: Meg Bradley ’11, Taylor Eckelberger, and Amelia-Rose O’Connor ’09. Bottom row: Julia Bollinger ’09, Zoe Keve ’09, Rosey Puloka ’10, Heather Manley ’08, and Jennifer Figarola ’08. Angela Cobian won a seat on the Denver Board of Education in the Nov. 7 election. A Fulbright scholar who was president of the Colorado College Student Government Association, Angela has worked for Teach for America as a second- and third-grade teacher and earned a master’s degree in curriculum and instruction, with an emphasis on linguistically diverse education. 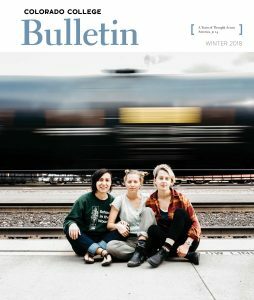 Eleanor Anderson was featured in the February/March issue of American Craft magazine. A fiber artist and ceramics artist, Eleanor is currently a fellow at Penland School of Crafts in North Carolina. She will be assisting with teaching a fiber arts class in arts & crafts during Block 8 and this summer during Block B.
Alex Kronman raised $3.1 million in his second funding round for flytedesk, his Boulder-based tech startup that helps big brands advertise on college campuses nationwide. Alex, who spent three years as editor-in-chief of The Catalyst, raised $2 million in his first round. He recently opened sales offices in San Diego and Washington, D.C., and hopes to soon open another in New York City.